Up until that spring Allen had mostly dabbled in comedic efforts filled with pithy one-liners and classic pratfalls centering on a singularly damaged nebbish character that juggled a myriad of trepidations through several bizarre scenarios. Annie Hall crystallized this concept in the guise of a couple; Allen’s comedian/writer, Alvy Singer and photographer/singer, Annie Hall, played with quirky ennui by Diane Keaton, who would go on to win the Academy Award for Best Actress. Both characters drift towards middle age anxious, lonely and spiritually lost in the greatest city on earth, which was then in the throes of its own spiritual decay; economic collapse, a spectacular rise in crime, while also capturing an underground esthetic in music, art and social upheaval. 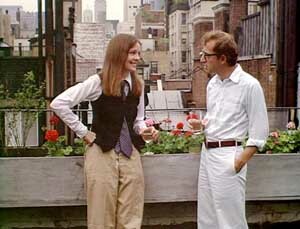 (Annie compares Alvy to New York; a damaged, isolated island).